Greek Salad and Hummus Pita Pizza for the perfect light and fresh lunch or dinner for one. So fresh and light! What’s great about having a food blog is you basically have a food diary that documents what you’ve eaten over the years and if you’re lucky, a little story behind it. 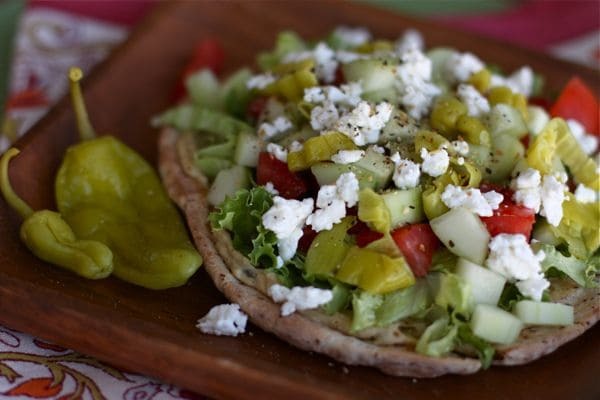 For example, I stumbled across this recipe for Greek Salad & Hummus Pita Pizza in my blog archives recently and was instantly brought back to a season that I remember eating these very very often. 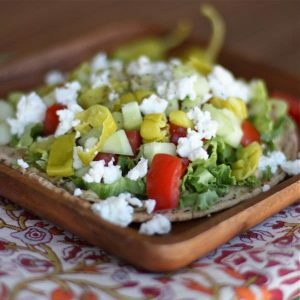 These pita “pizzas” are so incredibly light and delicious I really wanted to share them again with you, in case you are looking for new ideas for lunch or light dinners. ‘Tis the season for light dinners right? If you haven’t already and have a minute, would you mind filling out my first ever Reader Survey? It’s my way of getting to know you a little better. Thank you to everyone who has already taken the time to complete it, I’ve loved reading through your answers and I appreciate you so much!! From the looks of it, all I’ve been eating lately is salad and pizza. There’s a little truth to that. And before I forget, I have to tell you about this pita bread I found at Walmart (now it’s at my regular grocery store, Publix). One pita bread is only 60 calories, has 4 grams of fiber and 6 grams of protein. It’s called Joseph’s…look for it! It has slightly changed my life as far as pita bread is concerned. Spread hummus on lightly toasted pita and top with lettuce, tomato, cucumber, pepperoncini and feta. Season lightly with lemon pepper seasoning and enjoy! This looks so fresh and bright for winter time! What a fantastic idea! I’m a greek salad fanatic- is there anything better? Haa! I LOVE putting cheese and fresh chopped veggies on crackers and calling it ‘pizza’ (it IS like healthy pizza!!! ) Im so pleased someone else does the same!! This looks like a fabulous idea love – I ADORE greek salad so so so so much!! You just read my mind…I was literally just thinking how great pizza and a big Greek salad would be! Oh this looks like a perfect lunch! Love hummus! This looks delicious, Aggie! What a great idea. I cannot wait to try it for lunch very, very soon. LOVE, love these flavors. This looks amazing, Aggie! I see this becoming my lunch some time this week! Looks wonderful! Look at all those veggies! I love Greek salads! Also thanks for the giveaway announcement. One of your readers might win! This is right up my alley. Looks so delicious! What a creative and delicious idea for salad! Thanks for sharing this wonderful recipe and inspiring me with something new. You have a lovely blog and I’m glad to have found you! I love all of your salad recipes, Aggie and this does indeed look like the perfect night-in dinner. I’ll have to look for those pitas. Fantastic idea, putting hummus and salad on pita bread an elevate it pizza status without the cooking. Looks beautiful and is good for you too. I love the colors of this pizza – not to mention all the scrumptious ingredients. I’m definitely a sucker for anything greek. Yummy! just came home with Costco sized kalamata olives…I’m in trouble. This looks so great with all the fresh veggies on top! Yum! Good recipe on greek salad. I love hummums. Aren’t those pitas the best? They also make them in the form of sandwich thins, which I love for burgers. This would make a fantastic work day lunch!